'This film is an incredible time capsule documentary. Basically a Swedish television station had loads of forgotten film footage somewhere in their basements and they didn't even know what it was. Then it was discovered that it was a treasure chest of material involving the Black Power movement in the United States in the 70s. 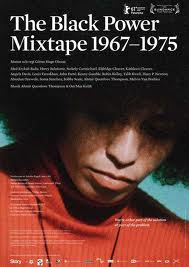 Filmmaker Göran Olsson re-edited the material, and included some voice-over narration from people who are still living form that time period, like Angela Davis. The footage is both evocative and informative, and beautifully edited. There's shots of everyday street scenes interwoven with interviews with the Black Panthers and dramatic footage of rioting and police brutality. This is the kind of history that you will never witness in history books. Documentary films can be so exciting, but mostly these days they are so boring in the way that they are made… in this film the archival footage is refreshing- even if there is a talking head shot, it is still raw, alive, vital… and not overly-lit, set-up and dead looking.